Versailles junior Hannah Barga drives to the basket during a Midwest Athletic Conference battle with St. Henry on Thursday night. 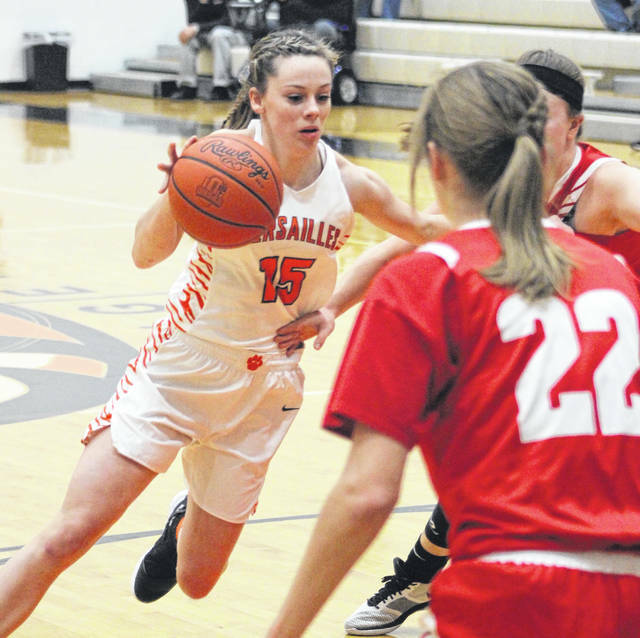 Barga led the Lady Tigers with 10 points in their 49-43 win over the Redskins. 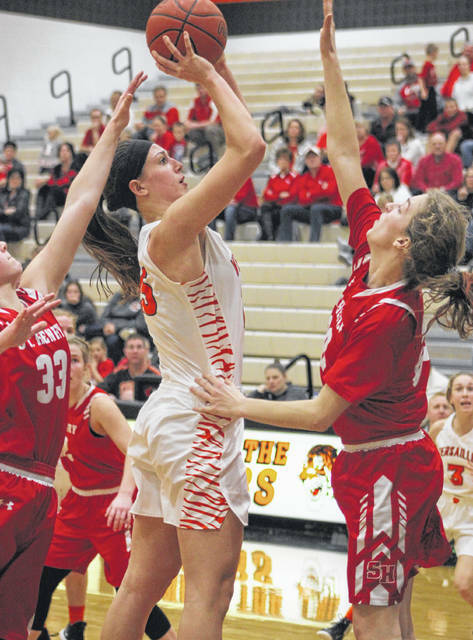 Versailles junior Lindsey Winner takes a shot over top of a St. Henry defender in their Midwest Athletic Conference battle on Thursday night. Winner had 10 points to help lead the Tigers to a 49-43 win. 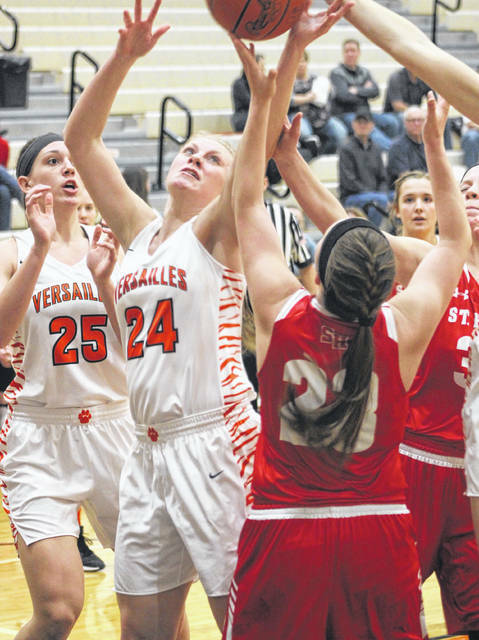 Versailles junior Lindsey Winner (25) and senior Liz Watren (3) trap St. Henry’s Nora Vaughn in the corner during a Midwest Athletic Conference battle on Thursday night. The Tigers won the game, 49-43. 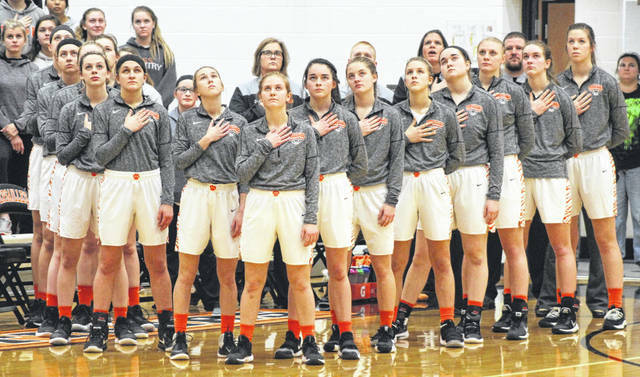 The Versailles girls basketball team stands for the National Anthem prior to the start of their Midwest Athletic Conference contest with St. Henry on Thursday night. The Tigers won the game, 49-43. Versailles’ Brooke Stonebraker fights for a loose ball during a Midwest Athletic Conference battle with St. Henry on Thursday night. The Tigers won the game, 49-43. Versailles junior Caitlin McEldowney goes in for a score and a foul during a Midwest Athletic Conference battle with St. Henry on Thursday night. The Tigers won the game, 49-43. 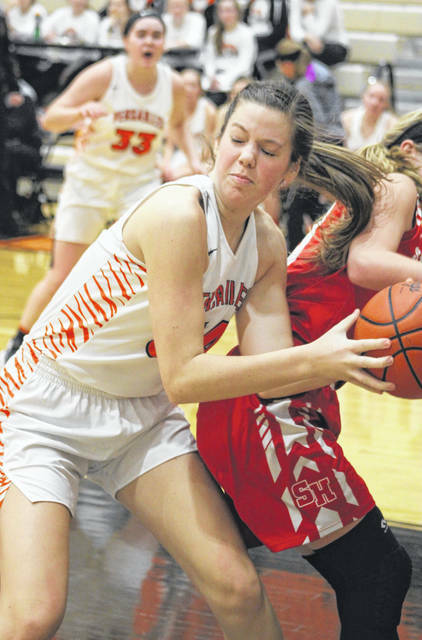 Versailles senior Elizabeth Ording (24) fights for a rebound with several St. Henry players during a Midwest Athletic Conference battle on Thursday night. The Tigers won the game, 49-43. Versailles junior Hannah Barga drives through an open lane against St. Henry during a Midwest Athletic Conference battle on Thursday night. The Tigers won the game, 49-43. Versailles junior Caitlin McEldowney looks for an open teammate while being guarded by St. Henry’s Marlee Vaughn during a Midwest Athletic Conference battle on Thursday night. The Tigers won the game, 49-43. 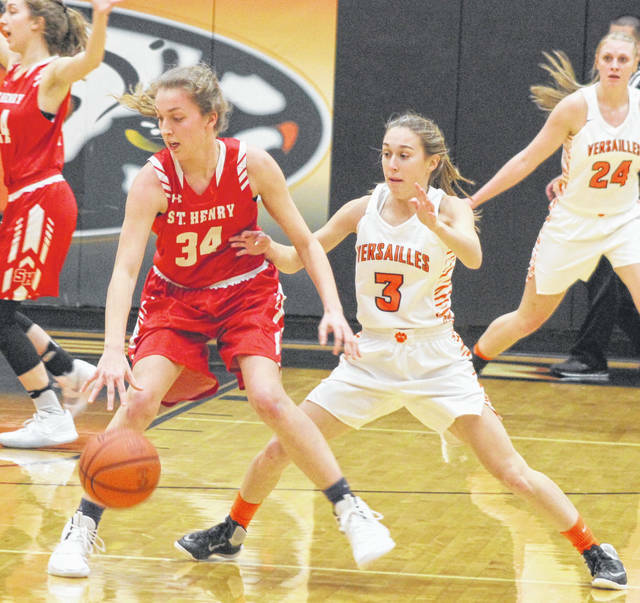 Versailles senior Liz Watren (3) plays some tight defense on St. Henry’s Nora Vaughn (34) during a Midwest Athletic Conference battle on Thursday night. The Tigers won the game, 49-43. 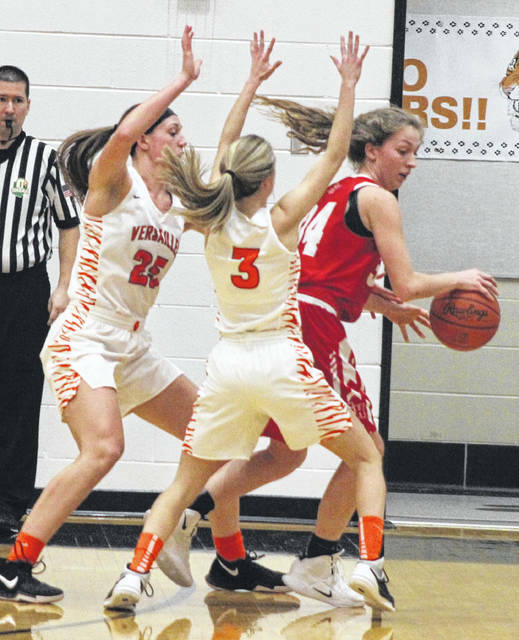 VERSAILLES – In a span of about 8 seconds in the third quarter, Versailles got what essentially amounted to a 5-point play to go up on St. Henry by nine points, 35-26. Caitlin McEldowney got a steal on an in-bounds play by St. Henry and put up a two-pointer at the 3:13 mark of the third frame. She drew the foul as well, but when she missed the free throw, Brooke Stonebraker grabbed the rebound and kicked it out to Hannah Barga who drained a 3-pointer to complete the two-possession, 5-point play. It was the turning point of the game despite the fact that the Redskins would make a final run at the host Tigers late in the fourth quarter. 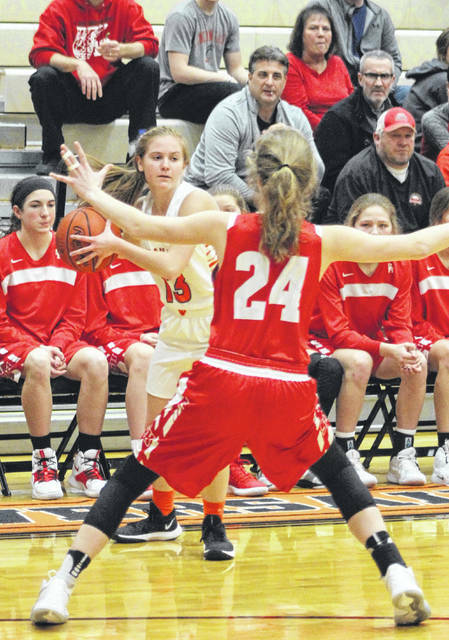 St. Henry pulled within two with 1:22 remaining, but began fouling Versailles who sent both McEldowney and Liz Watren to the line sinking 4-of-7 to win the game. St. Henry made a feverish run at the Tigers in the fourth quarter cutting the lead from 45-36 to 45-43 with just over a minute to go in the game. Nora Vaughn hit a 3-pointer to start the 7-0 run and Danielle Lange and Alyssa Buschur each had regular buckets to close that gap. But Liz Watren went to the free throw line with 1:09 left and sank both shots to stretch the lead back to four points for the Tigers. With 28 ticks left on the clock, McEldowney hit the second of two free throws for a 48-43 lead and then Watren did the same with 8 seconds left for the final margin as Versailles, currently ranked sixth in the most recent Division III state poll, survived the late run. Nora Vaughn led all players with 15 points, but the next highest scorer for St. Henry was Lange with 9 points. The first half wasn’t the best for Versailles, which trailed 11-9 after the first quarter. The second quarter was a little better for the Tigers. Barga opened the frame with her first triple of the contest to push her team back in front 12-11. 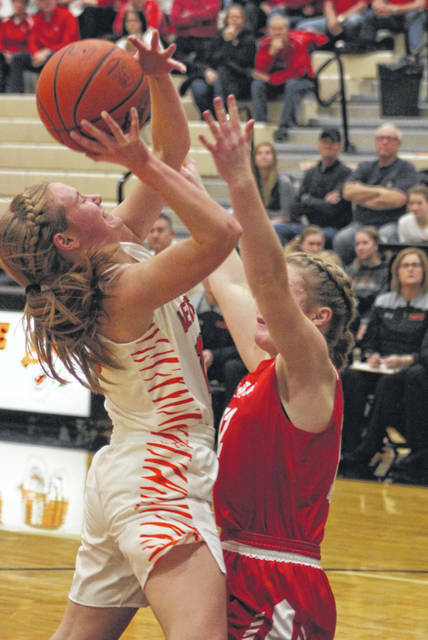 Elizabeth Ording then got a basket and Barga hit a pair of free throws to surge ahead 16-11, but the Redskins weren’t about to lay down and fought all the way to the buzzer sounded as Cora Stammen sank a deuce to get her team within one point at halftime, 24-23. “Have you ever seen a MAC team just fall over? No,” Stonebraker said. “They don’t so we know that we are in a game. Yes we might have a 10-point lead but you know they are going to put something together to comeback. They are not just going to fold so that is what we keep preaching to our girls. Keep going, keep it in drive and make sure you keep going and never let up. Barga, a junior, led the Tigers with 10 points. Fellow junior Lindsey Winner also had 10 points for VHS, 8 of those coming in the second half. After Barga and Winner with 10, Kelsey Custenborder had 7 points, Ording had 6 and McEldowney added 5. 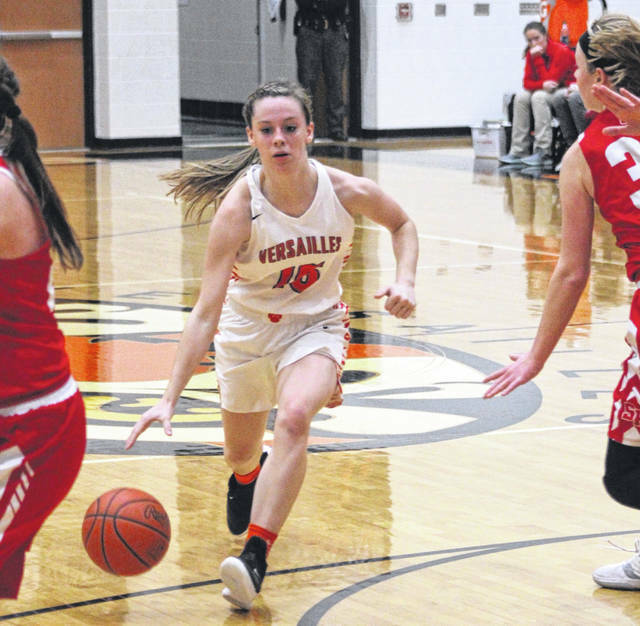 Versailles was scheduled to play Arcanum Saturday morning, but the forecasted snowstorm forced the cancellation of that game. It is rescheduled for Feb. 5. The Tigers next game will now be at home against Franklin-Monroe on Tuesday. St. Henry – Cora Stammen 2 0 4, Addy Vaughn 2 1 5, Danielle Lange 4 0 9, Allison Siefring 1 3 5, Carleigh Deitsch 1 0 2, Alyssa Buschur 1 1 3, Nora Vaughn 6 1 15. Totals: 17 6 43. Versailles – Liz Watren 0 3 3, Caitlin McEldowney 2 1 5, Hannah Barga 3 2 10, Danielle Kunk 1 0 2, Savannah Toner 0 2 2, Elizabeth Ording 3 0 6, Lindsey Winner 5 0 10, Kelsey Custenborder 3 1 7, Brooke Stonebraker 2 0 4. Totals: 19 9 49. 3-pointers – St. Henry 3 (N. Vaughn 2, Lange 1), Versailles 2 (Barga 2). Records: St. Henry (9-5, 3-2 MAC), Versailles (11-3, 6-0 MAC). JV score: Versailles 40, St. Henry 29.